The highest charting new entries on the Global Concert Pulse chart this week are Brazilian Roberto Carlos and Mexico’s Banda Sinaloense MS de Sergio Lizarraga, coming in back to back at No’s. 29 and 30. Roger Waters is at No. 1 thanks to his run throughout Mexico, which included a $4.26 million gross over three nights at Palacio De Los Deportes in Mexico City. Those shows moved an impressive 42,654 tickets. Roberto Carlos, aka The King Of Latin Music, reported 10 engagements with an average gross of $575,345. His tickets were going for an average of $84 and he was averaging 6,817 for each one of them. He submitted reports from throughout South America in 2018, a highlight of which was the $926,474 over four nights in Sao Paulo, Brazil. Carlos also raked in a nearly $1.28 gross over two nights at Auditorio Nacional in Mexico City, Mexico. He has some dates coming up in the U.S., with stops planned in Illinois, California and Texas. 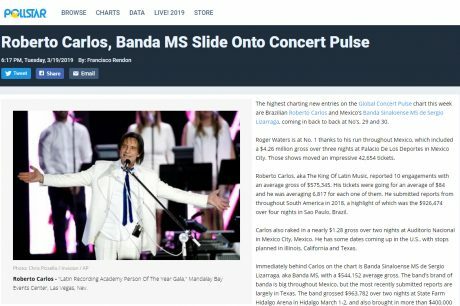 Immediately behind Carlos on the chart is Banda Sinaloense MS de Sergio Lizarraga, aka Banda MS, with a $544,152 average gross. The band’s brand of banda is big throughout Mexico, but the most recently submitted reports are largely in Texas. The band grossed $963,782 over two nights at State Farm Hidalgo Arena in Hidalgo March 1-2, and also brought in more than $400,000 in Laredo and Cedar Park. Perhaps most famously, Banda MS is the former group of singer Julion Alvarez. The group reported more than $8 million grossed in 2017. Comedians Jim Jefferies (No. 35) and Bert Kreischer (No. 97) also jumped onto the chart this week. Jefferies, a former Hotstar, reported an average gross of $475,072 per market engagement, appearing just behind Jerry Seinfeld on the chart despite approaching near double his average ticket count. Kreischer, who hosted the 2019 Pollstar Awards, was averaging $89,565 per market appearance, with 2,445 tickets and an average ticket price of almost $37. Other new entries on the chart include Christ Botti (No. 87); Brothers Osborne (No. 94); Beirut (No. 96); Lauren Daigle (No. 98); Rodney Carrington (No. 99); and Dwight Yoakam at lucky No. 100.